A fawn named Bambi is born and destined to become "Prince of the Forest". 1942’s Bambi marked the end of Disney’s golden age. 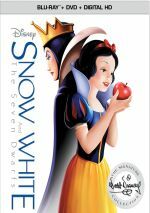 Starting with 1937’s Snow White and the Seven Dwarfs, the studio ran off a string of acknowledged classics. Bambi finished that, as efforts over the next few years wouldn’t offer the same scope or stunning beauty of those first five. Of course, Disney would rebound in 1950 with Cinderella and then toss out a good decade’s worth of quality features, but those first five remain some of their most notable achievements. At the start of the Bambi, we learn that a new prince has been born. This would be young deer Bambi (voiced by Donnie Dunagan), the apparent heir to the throne of the forest leader. All the other animals flock to see the newborn, and that includes young rabbit Thumper (Peter Behn), a bunny who often gets into trouble when he speaks his mind. 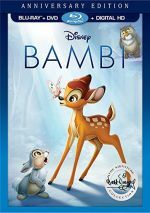 Much of the movie follows Bambi’s development and early experiences. He pals around with Thumper, learns to talk, and learns about the pleasures - and dangers - of the meadow. There he meets young doe Faline (Cammie King), his eventual love interest. We see Bambi go through various activities and grow up along the way. This leads through many life events toward adulthood and other circumstances. That ain’t much of a story, but it doesn’t really matter. No, you won’t get much from Bambi if you go looking for a deep plot or clever wordplay. Instead, it’s more of an experiential flick that simply watches Bambi as he grows and changes. Sure, lots of things happen along with way, but there’s never any semblance of a story. And that’s fine with me, though truthfully, Bambi is kind of an odd film. It doesn’t strive to be a documentary-style look at the real lives of forest animals - last time I looked, they didn’t have conversations with each other. But it also doesn’t anthropomorphize them to a tremendous degree. Yeah, they adopt human emotions and other attributes, but they don’t live in houses and drive cars like Mickey Mouse or Donald Duck. They also don’t break into song, which differentiates them from the critters in The Lion King, the “modern era” Disney flick that most resembles Bambi. Not only do both feature moderately anthropomorphized animals in their natural habitats, but also they present virtually identical opening and closing sequences. I forgot just how heavily the beginning and ending bits of Lion King “borrow” from it. That said, Lion King much more heavily emphasizes a story. That film becomes almost totally plot-driven, while Bambi focuses much more substantially on its characters. Which film proves more satisfying will depend on your preferences. It does take a while to get used to the ambiguousness of Bambi, as folks weaned on tighter narratives may find it to become somewhat frustrating at times. For me, I think the movie remains consistently involving and entertaining despite the absence of a real story, and it helps that it offers some of the loveliest animation ever to grace a screen. From start to finish, Bambi exhibits amazing attention to detail. For a prime example, look no further than the “April Showers” sequence and the lavish depiction of the raindrops. The rest of the movie follows suit. Not only does the flick show great clarity in the smallest elements, but also it presents wonderfully natural movement. The animators studied the source animals carefully, and that comes through via the smooth and believable action. It’s hard to imagine animation more fluid and gorgeous than this. Continuing in the plot’s “less is more” motif, the characters do a lot with a little. We don’t get broad characterizations, as the roles stay simple and likable. The movie always manages to avoid the cloying or precious side of the street, as it remains cute and charming. Some nicely honest vocal performances assist in this regard, as no part of Bambi gets played up in a showy manner. I won’t lie and state that Bambi is my favorite Disney animated flick. I enjoy it a lot, but I ultimately do prefer more story-driven efforts like Pinocchio or Lady and the Tramp. Nonetheless, I don’t know if Disney ever surpassed the artistry of Bambi, and they created a real winner with it. Bambi appears in an aspect ratio of 1.33:1 on this Blu-ray Disc. I’d be hard-pressed to find any real problems here. Across the board, sharpness seemed strong, as the movie never suffered from any undue softness. Instead, it looked appropriately well-defined and distinctive. A few multiplane shots showed a bit of fuzziness, but those were inevitable and not a distraction. I saw no issues with jagged edges or shimmering, and I also noticed no edge enhancement. Despite the movie’s advanced age, it displayed no source defects. The film lacked any specks, marks or other flaws, as it always remained clean and fresh. As one might expect from a flick that takes place in a forest setting, Bambi stayed with a naturalistic palette, and a fairly subdued one at that. The movie used restrained tones that looked full and rich here. The hues didn’t exactly leap off the screen, but they weren’t intended to do so, and the Blu-ray reproduced the colors well. Blacks also seemed dense and deep, while shadows were appropriately thick but not overly dark. Ultimately, Bambi looked very good. The Bambi Blu-ray came with a DTS-HD HR 7.1 soundtrack, and I found this modern mix to offer a tasteful expansion of the original monaural. The track didn’t exactly go nuts with ambition, as most of the audio remained oriented toward the center channel. Music showed the most activity, as the songs and score gently emanated from the sides and rears at times. They stayed in the middle for the most part, though, and the effects came from the same realm. A few elements like thunder and gunfire popped up in the sides, but that was about it. The track largely stuck with it is one-channel roots. As for quality, the audio sounded quite good given its age. Speech was slightly thin but usually appeared surprisingly full and natural. I noticed no issues with intelligibility or edginess and thought the lines came across well. Effects demonstrated moderate dimensionality and kicked in decent low-end response for some of the louder elements. Music also showed somewhat surprising range, as the highs were acceptably vivid and the lows demonstrated pretty solid presence. This wasn’t a stunning track, but it was definitely above average for a movie from 1942. Note that the Blu-ray included the movie’s original monaural audio as well as this multichannel remix. While I think the 7.1 track worked pretty well, I preferr to check out movie’s with their theatrical sound, so I’m happy we have a choice here. How did this 2017 “Anniversary” Blu-ray to the 2011 BD? Both seemed to be identical to me – if the 2017 version altered the 2011 picture/audio at all, I couldn’t discern the differences. The Blu-ray mixes old and new extras – I’ll discuss materials also found on the 2011 BD before I get into the 2017 disc’s exclusives. We open with an “extended version” of Inside Walt’s Story Meetings. This 70-minute and 24-second piece acts as a form of audio commentary, as it takes transcripts from story meetings for the film and has voice actors re-enact the remarks made by a mix of participants. We hear from Disney, story director Perce Pearce, consultant Don Graham, story developers Harold Miles, Bill Cottrell and Ted Sears, artistic consultant Sidney Franklin, animal anatomy consultant Rico Lebrun, supervising animators Eric Larson, Frank Thomas, story adaptor Larry Morey, story developer Ben Sharpsteen, supervising director David Hand, art director Thomas H. Codrick, sequence directors James Algar and Samuel Armstrong, story artist Joe Grant, animator Marc Davis, and supervising animator Milt Kahl. “Meetings” essentially follows the elements of the movie in the order they appear on screen. We hear issues related to the graphic depiction of the forest and recreating animals, liberties taken with the source novel and storytelling concerns, character development, cinematic techniques, casting and vocal characterizations. We also get info about musical themes and sound design, choices for character names, animation styles and choices, conveying the change of seasons and new personalities, the depiction of Bambi falling in love, the use of color in his fight, how much of “man” to show, and structuring the climactic hunt/fire. In addition to the comments, we see movie clips, development materials and sketches, and a few other useful snippets. For example, when Walt refers to a Pluto short used as an influence, we get to check out that segment compared to the shot from Bambi. We also watch rough animation, photos and research footage. Initially I felt disappointed that Bambi didn’t include a traditional audio commentary. However, after about five minutes of “Meetings”, I was totally entranced with this fascinating compilation and didn’t miss a commentary at all. “Meetings” gives us the impression that we’re there with Walt and the others, and it follows the movie’s development in an absolutely fascinating manner. It allows a “fly on the wall” feeling and shows us concepts and discussions in a concrete and rich way. Virtually every part of it works, though some are better than other, such as the discussion of how to depict the demise of Bambi’s mother. Disney fans should have a blast as they listen to this terrific program. As part of the Blu-ray’s “extended version” of “Meetings”, it offers branching video at times during the film. I counted 13 of these clips, and they featured notes from Disney artists Tyrus Wong and Mel Shaw, animators Will Finn and Eric Goldberg and Disney historians Paula Sigman, JB Kaufman, and Charles Solomon, and animation art restorer Ron Barbagallo. In addition to the featurettes, we find two deleted scenes – also located elsewhere on the disc – and two full-length animated shorts: “Canine Caddy” and “On Ice”. The “extended” elements pop up a little less frequently than I’d like, but they add some useful information. One unusual “bonus”: something called the DisneyView Presentation. Also found on a few other releases, it provides complementary artwork to fill the black bars on the sides of 16X9 TVs. This sounds tacky, but it actually works pretty well. The art meshes nicely and doesn’t distract from the film. It also helps avoid potential “burn in” problems on your set, as the art remains dark, but it’s not black and it changes. It’s a clever way to frame the movie. Next we find three deleted scenes as well as a deleted song. We see “Two Leaves” (3:07), “Bambi Stuck on a Reed” (1:56), “Winter Grass” (0:36) and “Twitterpated” (1:52). The first is genuinely odd, as it provides a discussion of the afterlife between the titular leaves. Even in a movie with talking animals, it’s weird to hear leaves speak – they do so at no other point in the film – and it’s a long digression that comes out of nowhere. On the opposite end of the spectrum, “Reed” is a cute comedic piece. I don’t know if it would’ve fit into the final film, but it’s amusing. “Grass” offers a short bit in which Bambi samples some not-too-tasty food. It becomes a minor diversion. “Twitterpated” would’ve come during the “blooming of love” sequence; we see an image of the owl and hear a modern piano-and-voice rendition of the tune. It’s hard to judge how this one would’ve worked, as the singer is too light-voiced and smooth to remind us of the crotchety old owl. It’s still nice to find as an extra, though. Next comes a documentary entitled The Making of Bambi: A Prince Is Born. In this 53-minute, 15-second program, we get notes from author/film historian John Culhane, Disney producer Don Hahn, Pixar Director and Executive Vice President John Lasseter, animator Andreas Deja, story developer Mel Shaw, author/historian Paul F. Anderson, animation historian Charles Solomon, environmental historian Dr. Ralph H. Lutts, clinical psychologist Dr. Maxine Harris, story artist Joe Grant, supervising animators Eric Larson, Ollie Johnston, Frank Thomas and Milt Kahl, animator Marc Davis, supervising animator Milt Kahl, Disney art director Ric Sluiter, background artists Rob McIntosh and Tyrus Wong, Disney Feature Animation director Aaron Blaise, Disney Feature Animation art director Cristy Maltese, Disney Toon Studios animation director Dave Bossert, animation art historian Ron Barbagallo, film historian Miles Kreuger, composer/author Ross Care, conductor John Mauceri, and actors Peter C. Behn, Donald R. Dunagan, and Cammie King Conlon. The program discusses story issues and parallels with The Lion King, Walt’s involvement and discarded concepts, the depiction of various scenes, character development, particulars of the animation and art, voice acting, the film’s depiction of backgrounds and the environment, the use of the multiplane camera, the film’s use of music, the adaptation of the original book, issues at Disney Studios during the period and the effects of a strike, and general thoughts about the project. “Prince” works in spurts. The opening segment about the story seems somewhat superficial since we’ve already listened to the excellent story meetings program; the parts about deleted segments are good, but otherwise there’s not much new on display. However, the program picks up well when it looks into the art and animation, especially when the original animators discuss their work. The section about the actors also is terrific, with some great stories like Dunagan’s fear as an adult that his Marine buddies would find out he had played Bambi. I don’t think any of the remaining parts are quite so interesting, but they still offer quite a lot of useful information. It seems odd that they discuss the book and Disney’s choice of it at the end, but that’s nonetheless a good section of the documentary. Though “Prince” doesn’t become an exhaustive look at Bambi, it covers the production well and presents an entertaining piece. Taken from the Disneyland TV series, we get an excerpt from a show called Tricks of Our Trade. Broadcast February 13, 1957, this seven-minute, 18-second snippet illustrates the use of the multiplane camera. Walt shows the limitations of usual animation photography and demonstrates the extra depth offered by the multiplane system. It’s old hat for longtime Disney fans, especially since we’ve seen this particular clip elsewhere. Nonetheless, it remains a concise way to inform people about the working of the multiplane camera. I know when I first started to learn about Disney animation, I found text descriptions of the multiplane to confuse me. This more visual demonstration makes matters clear, so it’s a valuable piece. When we go Inside the Disney Archives, we find an eight-minute, 39-second featurette. Animator Andreas Deja digs into the studio’s files to check out some storyboards for unfilmed segments, art done to establish mood and setting, backgrounds and other drawings. We’ve already seen some of this work elsewhere, but Deja’s perspective helps make this a fun glimpse of the original material. In addition to the film’s trailer, we get a classic animated short. 1937’s “The Old Mill” (8:58) focuses on life in the titular building. Already found on the Silly Symphonies “Walt Disney Treasures” set, this cartoon marked the debut of the multiplane camera, and it does offer some interesting visuals. However, it seems a little bland and not very interesting, though it comes across like an early test for 1940’s Fantasia, which worked on similar lines. The Golden Age lasts six minutes, 24 seconds and features Will Finn, Charles Solomon, Paula Sigman, and Eric Goldberg. The show looks at the growth in art/animation/audio at Disney during the late 1930s/early 1940s. “Age” offers a reasonable – though praise-heavy – view of the subject. With that, we head to the 2017 “Anniversary Edition” exclusives. Studio Stories delivers circa 1956 interviews with Walt Disney, as he discusses aspects of Bambi. Some of this echoes material from the “Story Meetings” commentary, but it’s a nice recap nonetheless. Two more Deleted Scenes appear: “Bambi’s Ice and Snow” (4:27) and “The Grasshopper” (2:57). Iin the former, we see Bambi’s first encounter with winter weather, while the latter shows a character who doesn’t appear in the final film. Both are fun to see, though “Grasshopper” works best since it uses an otherwise unknown role. We can watch these with or without introductions from Disney story artist Floyd Norman – the running times listed include his comments. Norman delivers some perfunctory remarks but nothing especially memorable. Another featurette called The Bambi Effect lasts three minutes. It gives us basics about Bambi, with an emphasis on aspects of art and animation. This turns into a brief overview without much insight – it feels more like an ad for other Disney films than anything else. A vintage short called Africa Before Dark comes next. From 1928, this five-minute, 50-second cartoon features Oswald the Lucky Rabbit - the character who presaged Mickey Mouse – as he visits Africa. Why appear on Bambi? Because it includes lots of animals, I guess – I see no other real connection. Whatever the case, Africa didn’t appear on the 2008 “Oswald” compilation so it’s a nice addition - even if it’s not an especially entertaining short, it’s good to see for historical reasons. For the final new addition, Fawn Facts brings us a three-minute, 34-second reel. It throws out minor details about the animals seen in the film. It’s probably good for kids but it doesn’t offer much substance. The disc launches with ads for Cars 3 and Beauty and the Beast (2017). Sneak Peeks contains the same promos. On a separate disc, we find a DVD copy of Bambi. It lacks any of the Blu-ray’s extras. Note that the 2017 Blu-ray drops extensive still galleries from the prior release. That’s the only major loss. Does animation get any better than Bambi? Nope. Do animated films get more entertaining? Yup, but Bambi remains a delight nonetheless. The Blu-ray offers excellent picture quality along with very good audio and a nice complement of extras highlighted by an insightful look inside the film’s preparation meetings. If you own the 2011 Blu-ray, there’s no strong reason to get this 2017 edition, but it’s a good release on its own.